Pragati maidan was the pride of Delhi when it was opened in 1982, that year the city hosted the Asian games. The sprawling exhibition complex, managed by the Indian Trade Promotion Organisation, has hosted hundreds of national and international trade fairs and exhibition since. It is spread over 149acres, and offers 61,290sq m of covered exhibition space in 16 halls, besides 10,000sq m of open area. It also houses the crafts Museum. 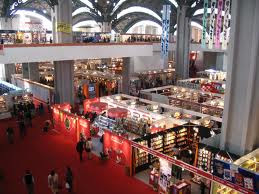 The India International Trade Fair, organised every November, and the International Book Fair, which takes place in February, are two of the biggest shopping events in the city. Pragati Maidan is also the venue for several other business fairs. Property, Jewelery, Health, Home decor, Gadgets......There's something on show here every time. This complex houses five permanent exhibitions which include the Nehru Pavalion, Atomic Energy and Defense Pavilion. Some of the events held in Pragati Maidan are the India International Trade Fair, World Book Fair and the New Delhi Auto Expo. Pragati Maidan is situated on Mathura Road, between the Purana Qila and Appu Ghar. Entrance is from Bhairon Marg and Mathura Road. It is near Delhi Zoo, Purana Qila, India Gate. hi! i want a volunteer job with trade fair my email id id sandhya_delhi@yahoo.com. hey i want to know about all the upcoming events of pragati maidan. what can i do? can u pls mail me the details ?? i am looking for a job in pragati maidan fair and my number email is chetansonu_123@rediffmail.com. need to know new coiming exhibition regarding bathroom fitting and building constraction.